Until the 1960s, oil tankers were restricted to around 50,000 tons, as they normally had to pass through the Suez Canal. The canal designed by the French engineer ‘Ferdinand de Lesseps’ was dredged to a depth of 26 feet between 1859 and 1869. Britain controlled the canal from 1875 - the Egyptian Nationalists expelled British oil and embassy officials in 1956. The Egyptian Nationalists gained control of Egypt in 1953 and nationalized the canal three years later. As they refused Israel use of the canal at that time, Israel backed by France and Britain invaded Egypt October 1956 in an attempt to overthrow the Egyptian leader. The war came to an end within a week as Russia threatened to back Egypt. This led to the United Nations demanding an end to the conflict before it escalated out of control. The canal then had to be cleared of wreckage under the supervision of the United Nations before being reopened to shipping in 1957. Below, the first super tanker Idemitsu Maru. More Images. The outbreak of war between Egypt and Israel in 1967 closed the canal for a second time. After Egypt and Israel reached an agreement to end that war in 1974, the canal was reopened the following year after being cleared of mines and sunken ships. During these wars, shipping companies had to transport oil around the Cape of Good Hope. This led to extraordinarily large ships being built to carry crude oil around the cape at an affordable price. There was a boom in shipbuilding at that time as shipbuilders had developed the technology to build oil tankers more than twice the size of any other type of ship built before. Idemitsu Maru was the first Super Tanker or Very Large Crude Carrier, this term is given to tankers over 200,000 dead weight tons (DWT). She became the largest ship in the world at that time at 210,000 DWT (fully loaded) with a draught of 58 feet. Japan also built the first Ultra Large Crude Carriers, tankers over 300,000 DWT. Nesseki Maru entered service in 1971 at 377,000 DWT, Globtik Tokyo entered service in 1972 at 483,000 DWT and Nessei Maru entered service in 1975 at 484,000 DWT. 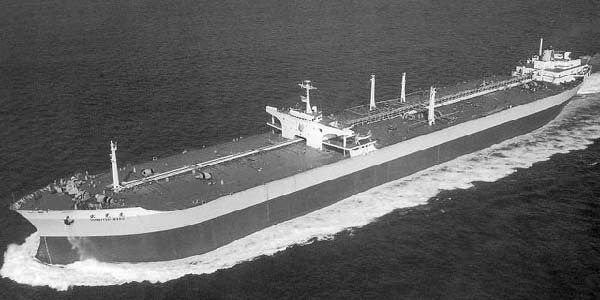 The first tanker to break the 500,000 DWT barrier was built at St Nazair/France, this ship named Batillus entered service in 1976 at 555,001 DWT. After the Egypt/Israel Wars, the Egyptians lost much of their trade as Super Tankers had by then outgrown the canals dimensions. This led to them dredging the canal in the late 1970s in an attempt to regain the immense revenue these ships created. With the completion of that work still not enough for the deep draught of the larger tankers; further dredging was carried out in 1995 to increase the depth to 58 feet. As that depth is still not enough to take the Ultra Large Carriers, it is expected the canal will be dredged to 72 feet by the year 2010. This depth will accommodate all but the few tankers that are over 500,000 DWT with a draught of approximately 80 feet when fully loaded. The photo below shows the difference between the Ultra Large Tanker Batillus and the 268,325 DWT Super Tanker Nordic Clansman. Idemitsu Maru was scrapped in 1980 and Batillus was scrapped at Kaoshiung/Taiwan in 1985. More Images of Batillus.